Monday Madness! Bacon Cotton Candy!! This Spring At Texas Motor Speedway, Cotton Candy Is Going Hog Wild. 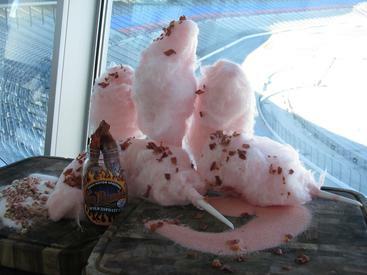 The Fort Worth track is unveiling a new signature treat for racing fans: bacon cotton candy. “Hawg Heaven Bacon Cotton Candy” features four ounces of bacon-infused cotton candy and topped with candy coated bits of real cooked bacon. The cotton candy will be sold in a specially packaged wrapper featuring the “Hawg Heaven Bacon Cotton Candy” logo during race weekend.